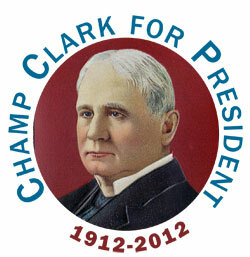 The Champ Clark Heritage Festival, held in September 2012, provided the platform as Champ Clark's candidacy for President of the United States was announced, "Champ Clark for President, 1912-2012." Constituents need not be concerned that Champ Clark passed away in 1921. The campaign paid homage to the prominent Pike County citizen, and the Midwestern values for which he stood. Champ Clark of Bowling Green, Missouri was unfairly denied the Democratic Presidential nomination at the turbulent Baltimore Convention of 1912. Due to a split in the Republican Party, if nominated Clark would have been elected the 28th President of the United States, the first Missourian to hold the Executive Office. Instead, due largely to the treachery of, and false charges levied by, party kingpin William Jennings Bryan, the famed Nebraska orator and 3-time (unsuccessful) Democratic standard-bearer, the nomination fell into the lap of the surprised Woodrow Wilson. Gov. Wilson, who had begun preparing a concession statement as a Clark victory seemed imminent -- only to be dissuaded by one of his managers -- was instead nominated, and served as President from 1913-1921. Clark, a Jeffersonian Democrat and 13-term Congressman, served as Speaker of the U.S. House of Representatives from 1911-1919. A poor country boy who crafted a career in elective office through sheer force of will, he was widely regarded as one of the most in-demand public speakers and powerful political figures of his era. The issues confronting America in 1912 still resonate today. Champ Clark was an impassioned advocate for the Midwest, the common person, and particularly the farmer. He was an avowed foe of the concentration of economic power among trusts, bankers and businesses along the country's Eastern seaboard; was in favor of vigorous antitrust laws and taxation of the income of wealthy individuals; and was a leader in promoting and achieving women's political rights. Clark also believed fervently that the United States should stay out of overseas wars. Had he been elected, it is unlikely that America would have entered World War One, and the course of international history would have been much, much different. This country could stand a return to these basic, grassroots principles today. Let's correct the error of 1912.